Saint Paul was born in Upper Egypt in about the year 229, and became an orphan at the age of fifteen. He was very rich and highly educated. Fearing lest the tortures of a terrible persecution might endanger his Christian perseverance, he retired into a remote village. But his pagan brother-in-law denounced him, and Saint Paul, rather than remain where his faith was in danger, entered the barren desert, trusting that God would supply his wants. And his confidence was rewarded; for on the spot to which Providence led him he found the fruit of a palm-tree for food, its leaves for clothing, and the water of a spring for drink. God revealed his existence to Saint Anthony, who sought him for three days. Seeing a thirsty she-wolf run through an opening in the rocks, Anthony followed her to look for water and found Paul. They knew each other at once, and praised God together. While Saint Anthony was visiting him, a raven brought them a loaf of bread, and Saint Paul said, See how good God is! For sixty years this bird has brought me half a loaf each day; now at your coming, Christ has doubled the provision for His servants. The two religious passed the night in prayer, then at dawn Paul told Anthony that he was about to die, and asked to be buried in the cloak given to Anthony by Saint Athanasius. He asked him this to show that he was dying in communion with Saint Athanasius, the invincible defender of the Faith against the Arian heresy. Anthony hastened back to fetch it, and when he was returning to Paul he saw his co-hermit rising to heaven in glory. He found his dead body kneeling as in prayer, and saw two lions come and dig his grave. 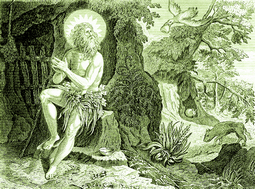 Saint Paul, The Patriarch of Hermits, died in his one hundred and thirteenth year.